What are lumens? How to measure light? How many watts a LED bulb consumes? These are just few of the topics about light covered in this article. We have tried to explain the fundamentals of light and how different aspects of light are measured using real life examples, highlighting the most important formulas, using informational images, graphics and tables, and also have made few calculators for easier calculations. Hope you find this article useful and if you have any comments, suggestions or additions, feel free to use the comment form below the article. Luminous flux or luminous power measures the total amount of light emitted by a light source over a period of time. In simple words, luminous flux tells how much light a lamp puts out in all directions per second, luminous flux is expressed in units called lumens (lm). Luminous flux only measures light radiated over visible wavelengths to a human eye from about 400-750 nm. 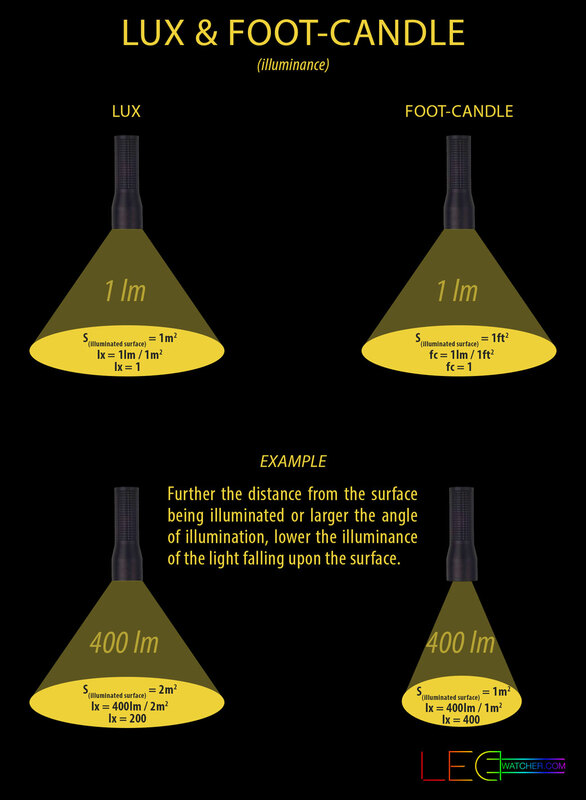 Lumen definition – lumen (lm) is a measurement unit of a luminous flux or luminous power. One lumen equals the amount of light emitted by a light source (radiating equal amount of light in all directions) through a solid angle of one steradian with an intensity of 1 candela. Luminous flux (in lumens) is usually indicated on the packaging of a light bulb (or can be found in special catalogs of light bulbs) and is used as an objective measurement of the light output of a light source to better compare various types of light bulbs. However, because lumens are measured at a specific distance in all directions from the light source, it isn’t the best measurement to describe how bright a light is going to be on a specific area. To describe this, a term called Illuminance and units called lux or foot-candle are used. Luminous intensity is the luminous power or the quantity of visible light emitted by a light source in a given direction per unit solid angle. Luminous intensity is measured in candela (cd) which is a SI base unit. Basically, it measures the quantity of visible light emitted in one specific angle from the light source, which is a useful measurement when comparing devices that produce focused beam of light such as spot lights, flashlights and laser pointers. Candela definition – candela (cd) is a measurement unit in SI of luminous intensity. Candela replaced the older unit that was used to express luminous intensity – candlepower. One regular candle emits approximately 1 candela of luminous intensity, this is why candela was also called candle in older times. To recap, luminous flux measures how much total visible light is emitted by a light source, the unit of luminous flux is lumen (lm). Luminous intensity measures how much light is emitted by a light source in a single direction, the unit of luminous intensity is candela (cd). So basically, if you need a light bulb that emits light in all directions (for example ceiling light in a house) look at lumens when comparing various bulbs, however, if you need a light that can focus the maximum amount of brightness in a smaller beam such as a spot light or a flashlight, look at candelas when comparing such lights. Besides these two, illuminance is also an important metric, measuring the amount of light falling on a given surface (measured in lux or foot-candles), but later with this. sr = steradian (square radian, one square radian of a general sphere can be calculated using an equation A = r², where r is radius of a sphere). 1 lumen = 1 candela; a light source with 1 candela intensity produces 1 lumen of luminous flux in a sphere with 1 square meter surface area. lm= 12,57; a light source with 1 candela intensity produces 12,57 lumens of luminous flux in a sphere with 1 meter radius (or 12,57m² surface area). Lets look at a new example, we have a light bulb that emits 700 lumens of light uniformly in all directions, with the same transparent sphere with 1m radius over the bulb. 700lm/1sr ≈ 700 cd; this approves the first rule that 1 lumen = 1 candela when light is produced through a sphere of 1 steradian. 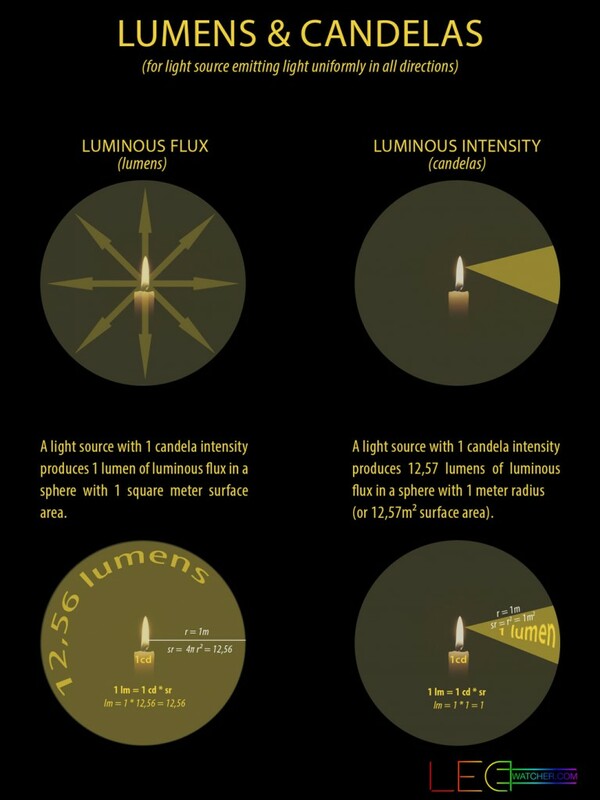 To even better illustrate the difference between luminous flux (lumens) and luminous intensity (candelas), imagine a light bulb that produces 1 candela or 12,57 lumens, if you cover one side of the bulb it will still produce the same light intensity of 1 candela, but half the luminous flux – 6,28lm. This is because candelas measure the power of light, how bright the light will be in a certain direction, so in this case covering half of the bulb won’t affect the intensity of the light (if it’s measured at uncovered part of the bulb). But because lumens measure the total amount of visible light from the source, covering half of the bulb will decrease the total amount of visible light by half. This is why you should compare candelas when purchasing a spot light or flashlight with concentrated light beam and lumens (or lux) when purchasing indoor lighting such as ceiling lights or outdoor flood lighting. These previous calculations and formulas were mostly attributable to a light source that is isotropic or in other words, emits light uniformly to all directions. 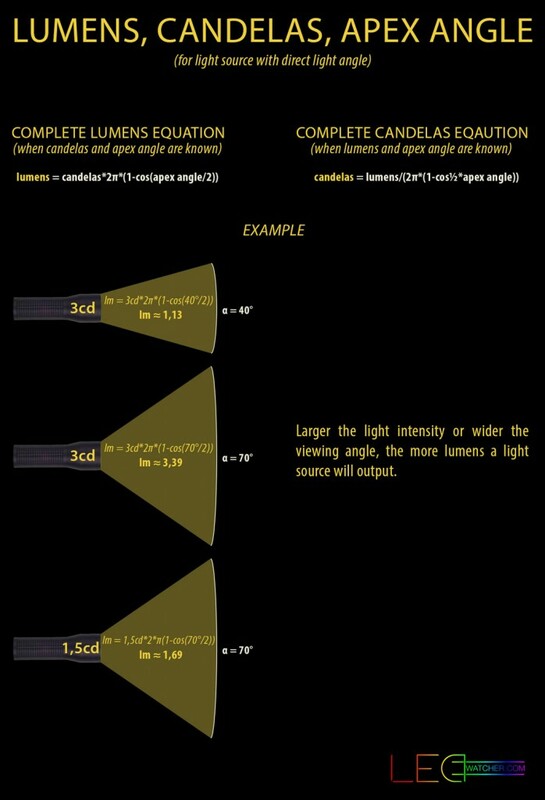 Now lets look how to calculate candelas and lumens in light bulbs at certain angles. In the same 1cd = 1lm / sr equation, sr indicates the viewing angle (also called apex angle) through which a light is emitted when calculating luminous intensity and luminous flux. In previous examples we calculated lumens and candles assuming that light is emitted uniformly to all directions (or in one example through a solid angle of one steradian, where 1 lumen equaled 1 candela), but usually we purchase lighting fixtures that illuminates light in a certain angle, spot lights illuminate in a narrower angle to provide more focused beam while flood lights illuminate in a wider angle to cover larger surface area. When looking at the same equation 1cd = 1lm / sr, we can conclude that by increasing the luminous intensity (candelas), we should decrease the viewing angle (steradians) to produce the same luminous flux (lumens). And in opposite, if we decrease the luminous intensity (candelas), we should increase the viewing angle (steradians) to produce the same luminous flux (lumens). So we can say that luminous intensity is inversely proportional to the viewing angle, meaning that increasing one value at the same rate, the other will decrease. At the same time when calculating luminous flux, if we increase either the luminous intensity or the viewing angle, the luminous flux will increase, and in opposite, if we decrease either the luminous intensity or the viewing angle, the luminous flux will also decrease. 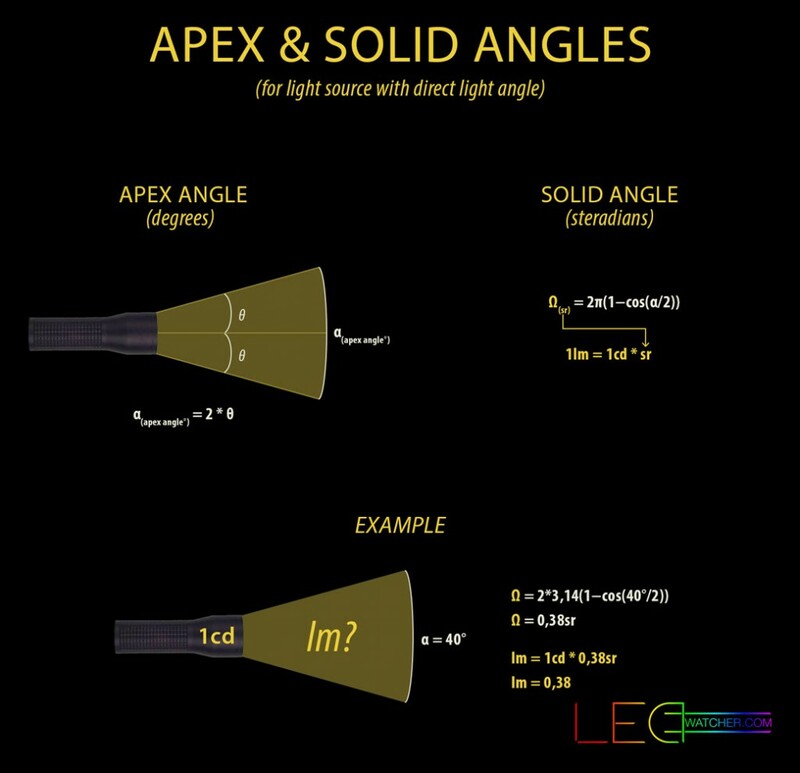 So how can we determine this apex angle of a light beam? where α is the apex angle measured in degrees. So it is true, if we increase the apex angle of a lamp while keeping the luminous intensity the same, the lumen output will also increase. Which it indeed does, 3,39lm>1,69lm. To summarise, luminous flux measures the total amount of visible light emitted in all directions, the unit of luminous flux is lumen (lm). Luminous intensity measures the quantity of visible light emitted in a given direction at solid angle by a light source, the unit of luminous intensity is candela (cd). The equation to calculate lumens, when candelas and solid angle of a light source are known is: 1lm = 1cd * sr.
Candelas are mostly used to describe brightness of lighting fixtures that produce focused beam of light at a narrower angle in a single direction, such as laser pointer, flashlight and spot light. Lumens are used to compare bulbs or lighting fixtures that illuminate in a wide angle and need to produce light equally in all directions, such as ceiling lights and some types of food lights. Generally, wider the beam angle of the light, lower the light intensity, and narrower the beam angle of the light, higher the light intensity. Illuminance is the amount of light or luminous flux falling on a surface. 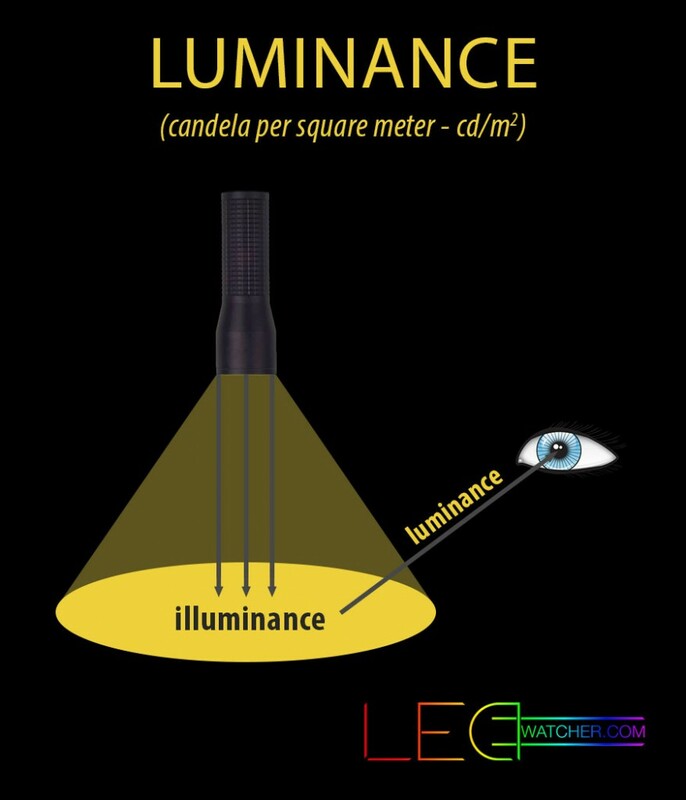 Illuminance is measured in lux (lumens per square meter) or foot-candles (lumens per square foot) using the US and British metrics. Illuminance is independent of type of the surface it illuminates on and only depends on the amount of light that falls on that surface, so it will be the same either when illuminating on a wall, ground, floor, tree or any other object. Illuminance (in opposite to lumens and other lighting metrics) can be easily measured with a simple device called a light meter, or even with a smartphone that has a special application installed. In the above formulas, m² represents the target surface area on which the light is falling on. What this means is that the further the distance from the surface being illuminated or larger the angle of illumination, the lower the illuminance of the light falling upon the surface is going to be. Illuminance is useful when choosing appropriate light bulbs or lighting fixtures for certain areas, such as bedroom, living room, office, shop, theatres, stages and similar areas. Lux is also an important measurement when choosing lighting for growing plants indoors. Luminance is the luminous intensity that is reflected or emitted from an object per unit area in a specific direction. Luminance depends on how much light is getting to an object and light reflection of that surface. The unit for measuring luminance is candela per square meter – cd/m². Basically, luminance is used to calculate how much luminous power will be emitted from a given surface at certain viewing angle and detected by a human eye or in other words, how bright will a given surface look to a human eye. Luminance is actually the only light form that we can see. Luminance is used, for example, when making traffic signs and road lighting. Many think that lumens for a light bulb or lighting fixture can be easily measured using a cheap light meter or even a mobile app, but in reality it requires a special device called integrating sphere connected to a spectrometer and a computer where special software must be installed that can show multiple metrics such as luminous flux or lumens, luminous efficacy, light spectrum distribution, color temperature and other lighting specifications. So actually, a lumen meter is not a small, portable device you can purchase for couple of bucks but more like a laboratory for measuring lumens and other metrics of light bulbs. Here is a video from Diode Dynamics showing the integrating sphere used for measuring lumens. luminance meter for measuring luminance. Lux meters are the most common ones that are used to measure illuminance or the amount of light falling on a surface. Lux light meter is used to measure the amount of light in photography and video filming, in individual houses and many public areas such as offices, shops, libraries, museums and other places to determine if the area has a sufficient level of brightness either for safe working conditions for employees (in offices) or simply for design purposes (in art galleries) and also to determine visibility in outdoor areas, for example, when choosing appropriate street lighting. Lux meter is often simply called light meter, because of its popularity over other light measuring devices. There are wide range of light meters available on the market based on their price, functionality and precision, starting from couple of dollars up to few hundred dollars for more advanced meters. There are even bunch of lux meter apps (free and paid) available on iOS and Android devices that can measure illuminance and some of these applications are actually pretty decent for basic light measuring tasks. Here are few of the most popular light meter apps for iOS or Android devices that you can test out by yourself. myLightMeter Free (By David Quiles). beeCam Light Meter (by FM.Bee Corp.). The measurement that describes relation between lumens and watts is luminous efficacy. Luminous efficacy is the ratio between the luminous flux and electric power of a light source, it measures how efficient a light source is at converting electrical power into visible light. The unit of luminous efficacy is lm/W (lumens per watt). we can calculate that that the light bulb will consume 10 watts of electrical power to produce 600 lumens of light. How many lumens are in a watt will depend on the type of bulb used in a lighting fixture. On average, old tungsten incandescent light bulbs will produce 15 lumens per watt while efficient LED bulbs will produce about 75 lumens per watt. Incandescent light bulb efficacy ≈ 15 lumens per watt (lm/W). 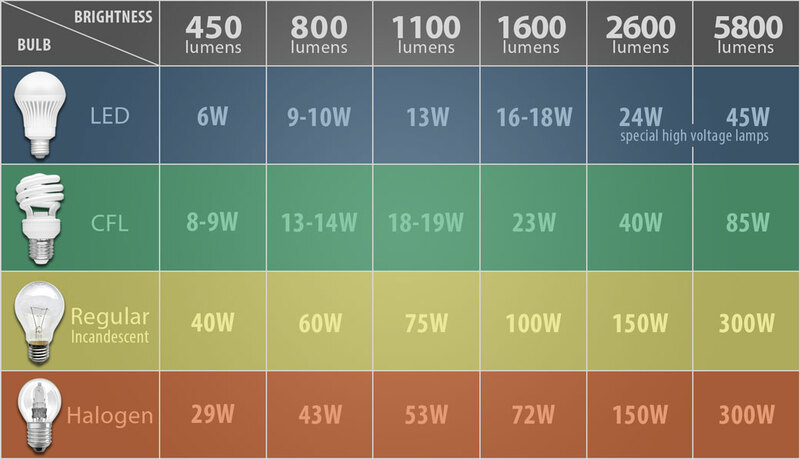 Here we have made a lumen comparison chart for LED, CFL, Halogen and Incandescent light bulbs (using the average lumens per watt rating of each type of bulb). How to properly clean different light bulbs? Loved it Arthur! I sell light bulbs at The Home Depot and found your information and knowledge so helpful. Now if a customer has some interesting questions I can run your calculators. That’s great! Thank you Cathryn. Your work is fantastic. The best and easiest to understand info available that I have found anywhere. The Calc’s are the easiest and most straight forward available as well. You make these calc’s fun to find the answers. Keep up the GREAT work and THANK YOU VERY MUCH. Thank you! This keeps me motivated!